As in many tropical areas around the world, Borneo’s rainforests are being cut and degraded for timber, palm oil, pulp, rubber and minerals. The increase in these activities is being matched by a growth in illegal wildlife trade, as cleared forests provide easy access to more remote areas. Logging, land-clearing and conversion activities are considered to be the greatest threats to the Heart of Borneo. Of particular concern is the conversion of natural forests to oil palm and timber plantations. The arrival of 2 alien intruders in the 1950s – the chainsaw and the caterpillar tractor – have perhaps made more impact than any other introduced species. Since then, the opening up of new roads has been a key factor changing Borneo. Roads not only provide access to commercially valuable trees, they also allow immigrant settlers, hunters and land speculators to access new areas of opportunities. Illegal logging has become a way of life for some communities, with timber being taken from wherever it is accessible, sold to collectors and processed in huge sawmills. In the absence of sufficient alternative economic development, this is an irresistible lure for the local communities. Satellite studies show that some 56% of protected lowland tropical rainforests in Kalimantan were cut down between 1985 and 2001 to supply global timber demand – that’s more than 29,000 km² (almost the size of Belgium). Protection laws are in effect throughout Borneo, but are often inadequate or are flagrantly violated, usually without any consequences. One of the biggest drivers of deforestation in the HoB and Kalimantan is the growth of oil palm plantations in response to global demand for palm oil, the most important tropical vegetable oil in the global oils and fats industry. Within Indonesia, oil palm production expanded from 600,000 hectares in 1985 to over 6 million hectares by 2007. 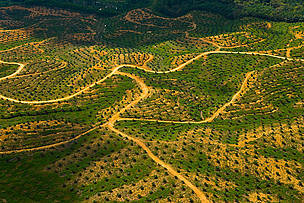 Oil palm development contributes to deforestation - directly and indirectly. About half of all presently productive plantations (over 6 million ha) were established in secondary forest and bush areas in Malaysia and Indonesia. Without the maintenance of very large blocks of inter-connected forest, there is a clear risk that hundreds of species could become extinct. 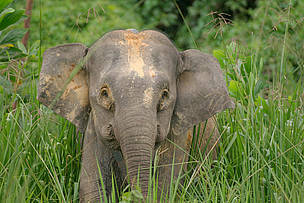 Large mammals such as orang-utans and elephants are particularly affected because of the vast areas they require to survive. For example, the Borneo elephant has increasingly come into conflict with the expansion of human agriculture activities in its natural habitat. Other smaller species, especially small mammals, may not be able to re-colonize isolated patches of suitable habitat and thus will become locally extinct. Road construction through protected areas leads to further separation of habitat ranges and provides easy access for poachers to some of the more remote and diverse tracts of remaining virgin forest. Many of Borneo's major rivers originate in the Heart of Borneo. Maintaining the forests is critical to ensure the island's water supply, moderate the impacts of droughts and fires, and to support ecological and economic stability in the lowlands. Malaysia and Indonesia account for over 90 per cent of the world's total oil palm production area, and the importance of these countries for this commodity is likely to increase in the future as demand soars. However, not all areas can be converted into plantations. In the Heart of Borneo, research has demonstrated that slope, soil and access constraints mean that most of the area is not suitable for oil palm plantations. As palm oil is the cheapest vegetable oil, the demand for this commodity as a source of food and energy is expected to rise rapidly. The demand for food alone is expected to double in the next decade, and the Indonesian government has responded by setting a target to increase oil palm production from 20 million tonnes in 2009 to 40 million tonnes in 2020. If the Heart of Borneo were cleared for what would be unviable oil palm plantations, this would seriously affect the region’s water catchment role and would impact the region’s unique biodiversity. The unsuitability of the terrain may also result in large-scale soil erosion, flooding and increase the risk of fire. When left undisturbed, Borneo’s natural forests are not usually prone to fires. But as forests are opened up by humans, they dry out and are increasingly susceptible to fires, which among other problems cause dangerous atmospheric haze. Properly managed, the forests of the Heart of Borneo can provide an effective break to the worst effects of fires. Fire and haze produce many adverse effects ranging from impacts on human health, short and long-term medical treatment costs, losses in tourism and forfeited timber revenue. The ability of forests to regenerate following large fires is greatly weakened. In the highlands of the Heart of Borneo, the risks of fire are still small as few people live in this densely forested area. But with forest clearance progressing in several places in Borneo, the risk of fire is constantly increasing. 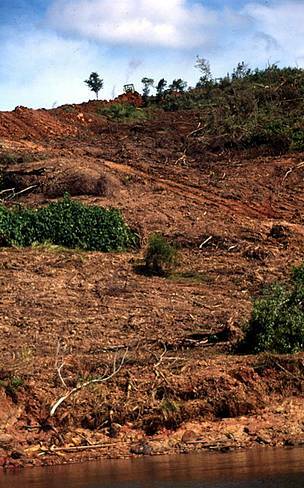 Deforestation and forest degradation account for up to 20 per cent of global man-made CO2 emissions. WWF projections indicate that if the island of Borneo continues at its current rate of deforestation, it will be severely affected by climate change through the increased risk of floods and forest fires, human health impacts, changes in agricultural yields and damage to infrastructure. Sea level rise is also projected to cause widespread damage to population centres, causing considerable economic damage and costs to local governments, communities and businesses. With two degrees of warming, Borneo’s rich biodiversity in marine, reptile and amphibian species will be severely affected, and potentially devastated by any warming beyond this level by 2050. Rampant poaching, assisted by the increasing number of roads and logging trails, poses a grave threat to Borneo’s endangered species. Wildlife crime is a big business. Run by dangerous international networks, wildlife and animal parts are trafficked like illegal drugs and arms. Experts at TRAFFIC, the wildlife trade monitoring network, estimate that it runs into hundreds of millions of dollars. Sir David Attenborough, renowned naturalist and filmmaker, chose the pangolin (Manis javanica) as one of ten species he would save from extinction . 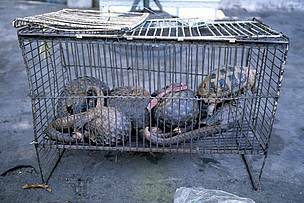 According to TRAFFIC, pangolins are the most common species of mammal in international trade, with animals being taken from all across Asia to meet the demand for use in traditional medicines, and for meat, mostly in China. Demand is greatest for the scales. Made of keratin - like fingernails and rhino horn - pangolin scales are used as a treatment for a range of ailments from rheumatism and arthritis, to reducing swelling and discharging pus. Pangolin meat is also popular and said to have general health benefits. The meat from pangolin fetuses is considered a delicacy. A 2010 TRAFFIC report estimated that one group in the Malaysian state of Sabah was responsible for taking 22,000 pangolins over 18 months. The Sunda pangolin, found in Borneo, is listed as Endangered on the IUCN Red List. The Borneo peat swamp forests are home to the world's most desirable aquarium fish, the Arowana (Scleropages formosus). The Arowana is thought to bring luck, wealth, prosperity and strength – all positive feng shui. People also believe the Arowana has supernatural powers, or that it symbolises wealth and refinement, like a piece of art. In Japan, the Super Red Arowana can fetch prices ranging between $2,000-$200,000. Due to its popularity, demand and outrageous price tag, the Super Red Arowana has been fished almost to extinction in West Kalimantan and it's extremely rare to catch one in the wild. Young orangutans are in demand for a flourishing pet trade, with each animal fetching several hundred dollars in city markets on nearby islands. 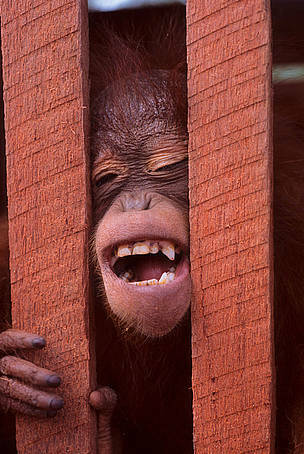 Studies indicate that 200-500 orangutans from Indonesian Borneo alone enter the pet trade each year. This represents a real threat to wild orangutan populations as orangutans have an extremely low reproductive rate. There is also trade in orangutan parts in Kalimantan, with orangutan skulls fetching up to $70 in towns. Orangutans are hunted for food in some areas. Hunting is the likely cause of the very low estimated densities of orangutans in low-hill forests, particularly in the upper reaches of the Katingan and Barito rivers in Central Kalimantan and Pawan river in West Kalimantan. Well-managed natural forests provide benefits to urban and rural populations in terms of high-quality drinking water. With 14 of Borneo’s 20 major rivers beginning their journey from the Heart of Borneo, the area is the source for the island’s considerable water resources. When forests are clear-cut, the soil is left exposed to the rain. In the event of heavy rainfall, the erosion in the upper catchments of all the big river systems has the potential to lead to major damage downstream. Poor management of upstream land and vegetation also has well-known adverse implications on hydro-electric facilities, filling up dams with sediment and damaging turbines. The economic costs that then arise can be massive. Similar adverse effects can be experienced on a smaller scale by rural communities at the downstream end of small catchments. The cost may not be high to the State or the economy at large, but rural villages may suffer economically and socially. Plans for economic development prioritise the exploitation of energy resources -especially coal - to help meet growing domestic and export market demands. Kalimantan holds 53% of Indonesia's 4,300 million tons of recoverable coal reserves, and Sabah and Sarawak hold 99% of Malaysia's 1,724 billion tons of coal deposits. Borneo also holds rich metal and mineral resources, including tin, copper, gold, silver, coal, diamonds, and different types of sand and stone. Together, the forestry and mining sectors are the main contributors to forest loss in Borneo.